After the Olympic Games in 2004, Athens public transport was greatly improved and visitors can move easily and quickly in any direction. The above buses stop at Onassis station or Planetarium from where you will walk 100 meters south and you will pass the underground passage of Syngrou to the east and south you will find the Nestorion Hotel behind the Planetarium. 1. You can get the tram from Syntagma Square direction Peace and Friendship Stadium SEF, Agia Skepi station. 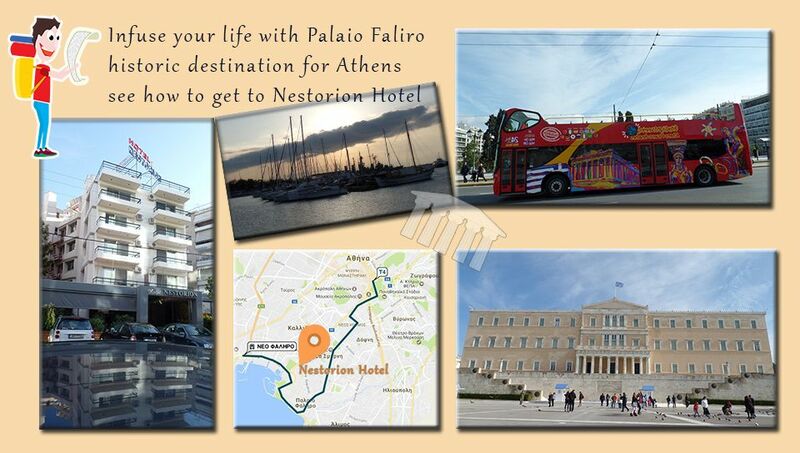 For the hotel you will walk north, below the airbridge and follow Zefyrou to the west where at the end of the road, on the right, you will see the Nestorion Hotel. 2. Bus 126 from Syntagma Square or Phix Metro Station, Bus stop Penteli Street and Colonel Zissimopoulou "Trapeza" close to the Rhea Gynecology Clinic. Then you will walk 5 minutes to Penteli No 8. 3. The A2 bus from the Academy terminal, Syntagma, Metro Fix. And you will get off at Amphitheus or Yassonos, from where you will walk south to Pentelis 8. 4. From Syntagma Square, metro to Omonia, change subway to Neo Faliro, change to tram to SEF from SEF to Ayia Skepi final stop, walk from Zefyrou Street 10 minutes to Pentelis Street 8. 2. 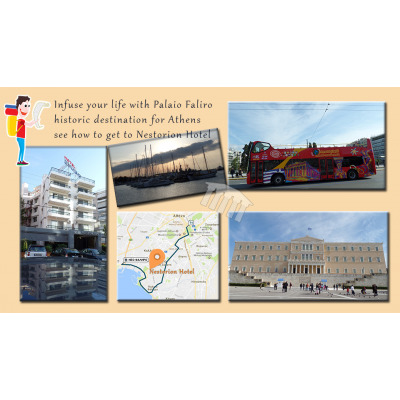 At a short distance from the port of Faliro/Kallithea and the indoor Olympic Stadium of Paleo Faliro. 3. At 39 km or 25 minutes from the toll-free seaport from Athens International Airport. 4. At 69 km from Sounio, Temple of Poseidon and 90 from the town of Lavrio, ancient theatre Thorikos where you can go for a wonderful trip by bus, IX, rented half or one day.